Scroggins, Roger Dale (27 Feb 1956 - 30 Jun 2012) [41329:C]. Son of Scroggins, Onnie Lee (5 Mar 1931 - 3 Jun 2011) [39847:C]. Scroggins, Leon Ferdell (28 Aug 1923 - 27 Jun 2012) . 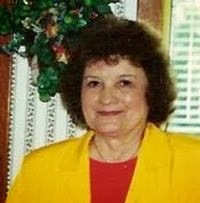 Son of Scroggins, Esther G. Pope (20 Oct 1926 - ) . Scroggin, Thelma Grace Roberts (3 Jan 1929 - 8 Jun 2012)  [FS:]. Widow of Scroggin, William Earl. ( 17 Jan 1930- 9 Dec 1997)  [FS:]. Scroggins, Vivian Vee Vickers (12 Feb 1935 - 7 Jun 2012) . Wife of Scroggins, Jamie ( - ) .